Fusion Green & White — rare white tea from China blended with top-quality green teas. Caffeinated and Kosher. Fusion Red, White & Blueberry — rooibos with the addition of delicate white tea and 100% natural blueberry. Caffeinated and Kosher. Chai White — an organic white tea with exotic chai spices. Caffeinated and Kosher. 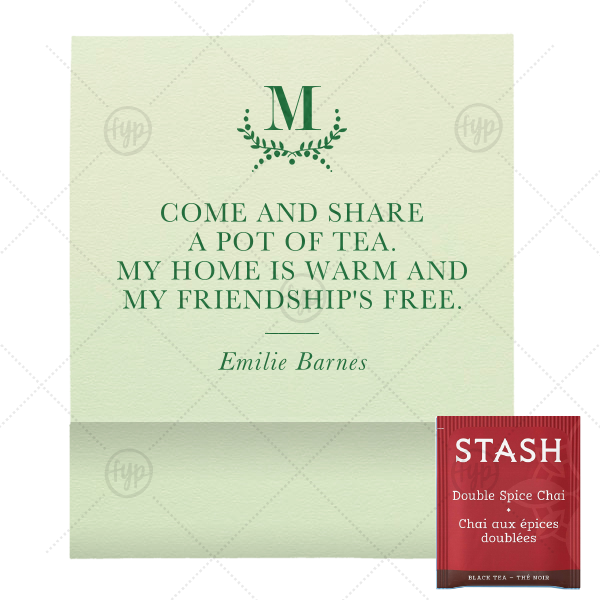 Personalize your Tea Favors with text and illustrations from our extensive, designer-curated collection. With over 100 paper colors, 150 fonts, 50 foil colors and 1,300 clipart images, you can create the perfect party accessories for your event. You also have the option to Upload Your Own Art for a truly unique product. Our personalized Poptone Mint Tea Favor with Satin Leaf Foil Color has a Branch 3 graphic and is good for use in Frames themed parties and can't be beat. Showcase your style in every detail of your party's theme!